In a dog-eat-dog world, “The Underdog” musical employs the life of everyday canines to expose the dark, seedy underbelly of the social class systems of humankind. 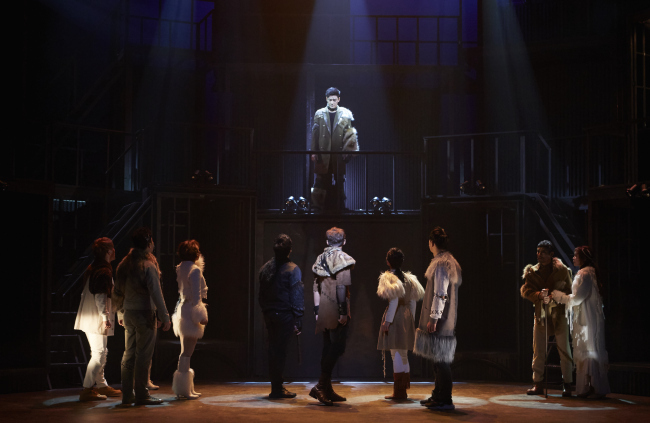 Rife with political and socioeconomic references, “The Underdog” opened its curtains in the theater district of Daehangno last week as part of Uniplex’s three-year anniversary celebration. The musical follows the life of a Korean Jindo dog, an indigenous breed known for its hunting skills and loyalty, named Jin. Mistreated, abused by his master and used in dog fights, Jin the underdog is eventually tossed away by his owner and left to fend for himself in the hard, cruel streets of the city. On the other side of the spectrum, Sophie the poodle, Jordie the dalmatian and Mattie the Maltese live in a care shelter for dogs, where they are well cared for and fed. The story line intensifies when the posh breeds encounter the cutthroat manner of Jin, who knows only one way of life -- kill or be killed. “In trying to impersonate this dog, I approached the role with the mindset of a minority, someone who has been neglected and shunned by society,” said Kim Joon-hyun, who plays the role of Jin, during a press conference held in Daehangno on Wednesday. The musical also stars Jung Myung-eun, Kim Pub-lae, Chung Jae-eun, Kim Bo-kang, Kim Jae-man and Lee Tae-sung, who is starring in his first musical in 14 years, also tackling the lead role of Jin. “The Underdog” is being staged daily (except Mondays) at the Uniplex 1 Theater in Daehangno, Seoul until Feb. 26. Ticket prices range from 33,000 won to 88,000 won. Tickets can be purchased online at interpark.com.